Some impressive speeds coming in from Stokes on the speed gun. He's touching 90mph and certainly rushing the batsmen. 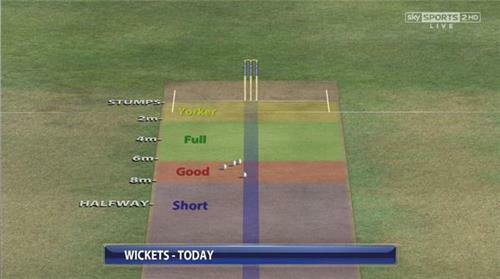 Just a Pujara single, worked to square-leg, off his latest over. Pujara and Rahane slowly playing their way in here..
[wicket]Massive wicket for England as Stokes finds a way through Pujara's seemingly impenetrable defence to knock back middle stump. Just nipped back enough to go through the gate. Stokes wheels away in celebration... as seen on the big screen on the Nursery Ground. People have asked about my phone conversation with Cook before Trent Bridge. It was a good chat & we spoke about lots of topics, that's it ! The last ball of a fine over goes past MS Dhoni's outside edge. Stokes good value for that key wicket of Pujara; he's been the one bowler who has consistently looked to bowl a threatening length even if it does mean scoring opportunities for the batsmen. Rahane gets two for a drive that is misfielded at extra-cover by Broad. This spell from Plunkett is a bit meh. Excellent spell from Stokes continues with a probing maiden over to Dhoni. Moeen back on for his second over of the day. Rahane drives him to mid-off and gets two after a Stokes parry before collecting four with a gorgeous punch through cover off the back foot. Fraction short, and Rahane jumped back with a dancer's grace to ping the ball into the gap. Today's style award unquestionably goes to Sabina for this chic number. Broad replaces the excellent Stokes. Immediately gives Broad the charge and misses an attempted drive at an outswinger. Curious decision. The next ball thuds into the thigh-pad. 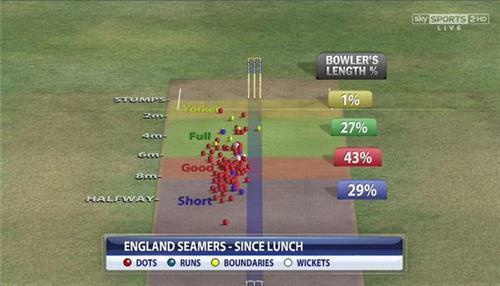 Broad is convinced it's lbw. The umpire is convinced Dhoni has hit it, awarding runs rather than a leg-bye. Both are wrong. Dhoni plays out a maiden from Moeen. Which is a touch unexpected. [wicket]Simple dismissal, and the sort of ball England should've been bowling all day. 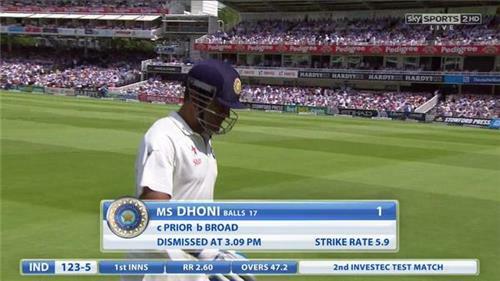 Full, swinging delivery from Broad, and Dhoni nicks it through to Prior. Boos for new batsman Jadeja after the Trent Bridge Incident. He plays out the rest of the over without much fuss. Suspect we'll see Anderson having a bowl before long. Meanwhile, Broad has 250 Test wickets. 13 - Stuart Broad is the 13th player and second for England after Ian Botham to take 250 wickets and score 2,000 runs in Tests. Value. No Anderson yet for Jadeja. Moeen continues with another maiden. India remain one, two, three, fo(ur), five. Which is always satisfying. 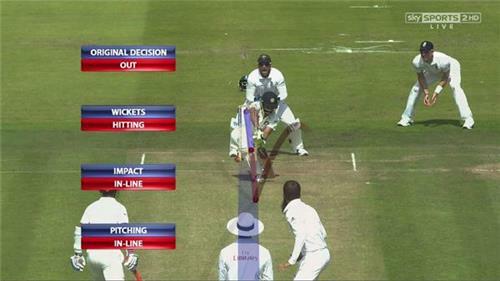 Huge leg-before appeal against Jadeja as Broad nips one back at the left-hander. Looked desperately close, but a fine decision from Bruce Oxenford with Hawk-Eye showing the ball going just over the off bail. Jadeja then gets off strike and off the mark with a clip off his pads for three. [wicket]Cook's decision to stick with Moeen pays off as Jadeja prods forward at one that doesn't turn and is plumb lbw as the ball thuds into his pad in front of middle and off. Binny the new batsman. Showed he can bat in the first Test, but these conditions are very different. 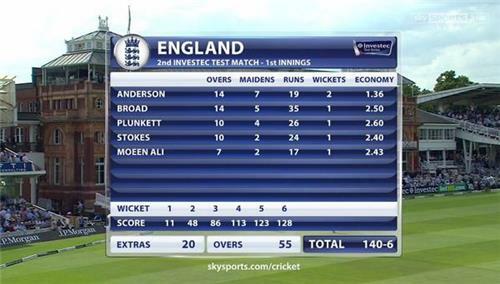 Anderson is back into the attack now, albeit with Jadeja not in his sights. Starts the spell with a maiden over that is generally a smidge too far wide of the off stump. Rahane leaving whenever he can. Good from Binny, charging Moeen and spanking him down the ground for four. India guilty of letting Moeen settle into his work here. Good to see a counter-attack at last. [Shanewarne] Swing, swing, swing for Jimmy Anderson. I don’t think there’s anyting wrong with the pitch whatsoever. As soon as you get a pitch like this it’s interesting to watch – you sense anything could happen. The crowd are on their edge of their seats." 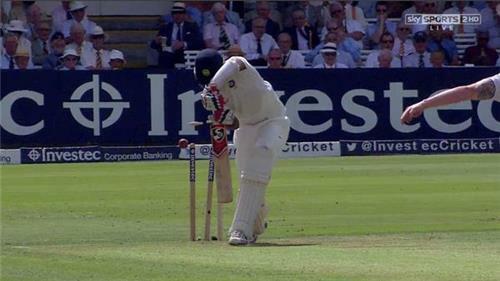 Good-looking drive from Rahane down the ground, but it's not perfectly timed. Bit low on the bat, and the batsmen have to scamper to get three. Binny hit on the pad by a hooping inswinger that would've missed leg. The batsmen saunter a leg-bye. Binny misses out on a full-toss from Moeen as the afternoon session comes to a close. Much better from England. Worrying that it took a lunch break to realise their errors, but England's lengths were far, far better in that session and they've been rewarded with four wickets to leave India in a spot of bother at 140-6. 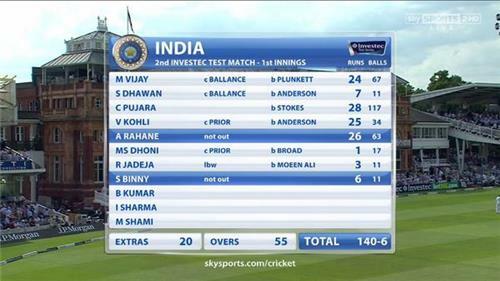 Pujara battled hard, Rahane continues to do so, but England will be confident of wrapping this innings up now. Or at least getting them nine down quite quickly. 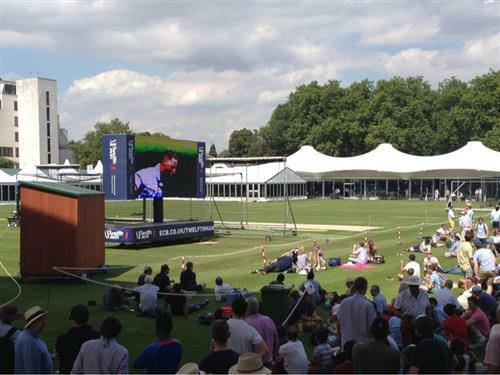 @SkyCricket agree with Shane Warne could watch cricket like this all day unlike the game at Trent bridge. Much better contest, a test. Much better from England after lunch ! Bowling coach must of had a few words... Poor this morning !! 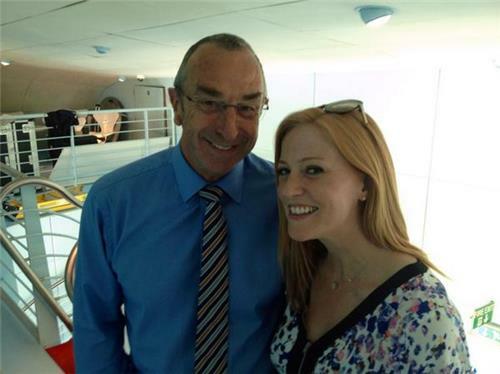 Bumble is backing England to wrap up India's first innings today - and is getting used to having his picture taken! 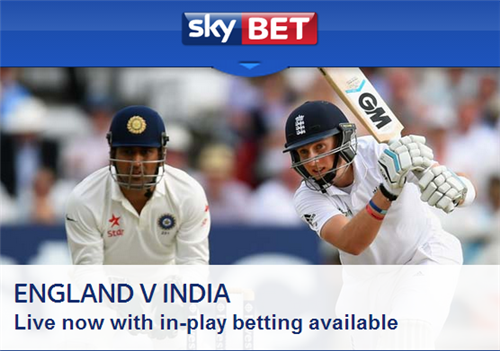 Keep up to date with all the in-play odds on England v India with Sky Bet here. Bumble's late night Tweet echoes the thoughts of many after the opening day here at Lord's. Last night's thunderstorms have been and gone and we're all set for what weather experts tell us will be a 'scorcher' at HQ - with temperatures potentially rising up to 32 degrees.